Developed by Omega Force, Team Ninja. Published by Nintendo. Released September 26, 2014. Available on Wii U. Copy provided by publisher. Hyrule Warriors is still one of those games I'm having trouble comprehending the existence of, despite sinking a ridiculous number of hours into it. In truth, a Dynasty Warriors spin-off featuring The Legend of Zelda shouldn't be that surprising - Nintendo and Koei have always been good friends, and there have been mutterings of a crossover for quite some time. Even so, I never would have expected to see two personally beloved games come together like this. Even better, the marriage between Nintendo's classic action-adventure series and Tecmo Koei's button-mashing hack n' slash powerhouse is almost everything I could have wanted it to be. Outside of some minor inconveniences and conceptual limitations, Omega Force has put together something truly delectable - even if those who dislike the core Dynasty Warriors games will find very little to get excited about. Those familiar with Koei's flagship series will find themselves right at home with most of what its Zelda-flavored offering brings to the table. Pitting two (or sometimes three) armies against each other, each stage has the player hack and slash their way through hundreds upon hundreds of enemy soldiers, mowing through peons and tackling tougher leaders, capturing keeps to sway the battle in the allied force's favor, and eventually taking out an enemy commander. Each of the game's thirteen playable characters have a unique fighting style, though utilize the same combo system for controller-bashing simplicity. As opposed to characters found in Dynasty or Samurai Warriors, the attacks performed by Hyrule's roster are all incredibly varied and flamboyant, from Agitha summoning giant beetles, to Ghirahim using his attacks to lock onto enemies before sending dark energy charging toward them. Combo attacks are more than just slashes and swipes, each one being an extravagant affair that's visually exciting, though often prone to leaving players vulnerable. Good job a dash command (replacing jumping) can cancel most attacks. Vulnerability is a big part of the game's combat balance, as most enemies (barring regular soldiers) are incredibly durable, able to happily absorb not only regular attacks, but even shrug off the allegedly powerful special moves that act like "Musou" maneuvers in other Warriors games. The only really effective way of dealing with most significant enemies is to let them attack and expose their weak point - summoning gauge that appears above their head which is whittled down when you hit them. Once that gauge is emptied, you can perform a special counterattack that deals a devastating amount of damage. It's a neat little system that adds some extra depth to battles, but it has the unfortunate side-effect of rendering most of a characters' moveset pointless in single combat. You can't do combo attacks in the presence of a named enemy leader, because they'll ignore them and chew through your health while you're stuck in the animation. Your special attacks deal barely anymore damage than regular ones, so you're stuck waiting around for the enemies to make their move before you can make theirs - and just hitting the regular attack button is the quickest way of depleting the weak point gauge. As characters level up, this becomes less of a problem, but it would be nice to have the same kind of offensive options available in other Warriors games, and feel more powerful as a result. Fortunately, there's a ton of bottom feeder soldiers upon which to take out any frustration, and with most attacks designed to wipe out ridiculous numbers of lesser enemies at once, it's more satisfying than ever to charge into a battlefield and destroy the opposition. Rare is the battle that ends without the player defeating over 1,000 enemies, and with such an impressive variety of cool and thematically fitting battle styles to indulge in, there's hours of enjoyment to be had in just getting to grips with each freshly unlocked Warrior. 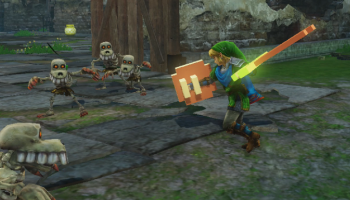 As well as the usual slicing and dicing, players get access to classic Zelda items, such as bombs that can be used to break through walls, or boomerangs that stun foes. These items come into play when facing off against large boss monsters, culled from classic Legend of Zelda games. These monsters are fought just like they would be in their respective games, with the bow used to fire arrows into Gohma's eye, and the hookshot employed against Argorok's tail. As with enemy generals, boss monsters must be countered with these select items after they pull off certain attacks, exposing a weak point gauge that's dealt with in the usual manner.